I have to say, when I saw this on the list of required reading for my Young Adult Literature class this semester, the only reason I was excited was because I already owned it and wouldn’t have to buy yet another book. After reading it, I realize how wrong I was to only be excited for it for that reason. This incredibly powerful read spoke volumes to me as a reader. I was so impressed and blow away by the language, raw and real, as a 14-year old Indian boy tries to find himself where he doesn’t belong. 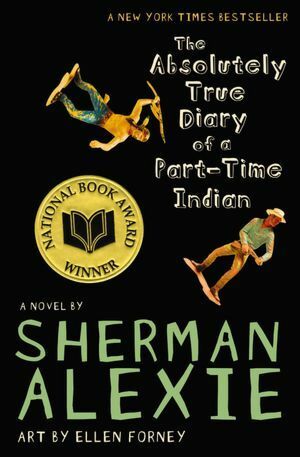 Sherman Alexi’s writing creates an experience for the reader, even one who has never and will never experience anything remotely like Juniors’ story, and allows us to understand what it is like to be a Native American on a reservation. The truths that Alexi speaks without ever preaching or reciting are simply breath-taking and at times, bring tears. I was overwhelmed reading this incredible book and I simply can’t express enough how much I loved it. I think this should absolutely be required reading for everyone, as it helps kids who may not fit in, but also teaches them to be a bit kinder to those who may not fit in right away. More than that however, it has so many lessons for adults woven into the heart-wrenching moments and sarcastic humor. This phenomenal story is one for the favorites shelf. I’m so glad I was forced to read it, because this will be one that will never sit on my shelf collecting dust again. Definitely pick up a copy and read it. You will not regret it.